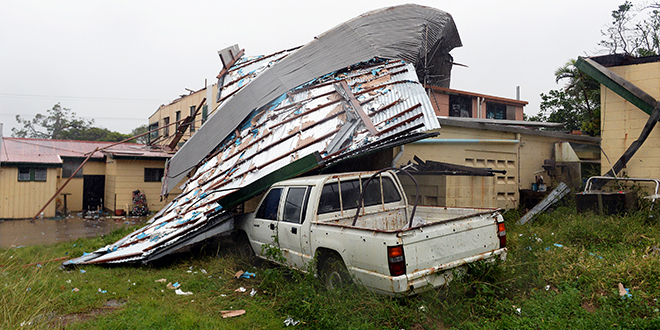 NORTHERN Queensland dioceses “dodged a bullet“ as Cyclone Ita crossed the coast on April 11 causing little damage to churches, schools and other properties. Cairns diocesan project services manager Shane Watson captured the sense of anticlimax and relief through northern parishes in the wake of the potentially devastating cyclone. “We’ve dodged a bullet, so to speak, with little damage anywhere around the diocese even where Cyclone Ita crossed the coast,” he said. Schools in both Townsville and Cairns dioceses were to open on schedule for Term Two with little damage to school property reported. A Cairns Catholic Education Office spokeswoman said it was a blessing that Cyclone Ita had crossed the coast when it did and weakened quickly. “If it had swiped along the coast at the predicted full-strength Category 5 there would have been immense damage,” she said. Masses and other Church services were impacted in Cairns and Townsville dioceses. Cooktown’s pastoral leader Mercy Sister Irene Masterson said branches broken by the fury of Cyclone Ita had been used in St Mary’s Church to celebrate a Palm Sunday prayer service with a difference. “Gratitude was the predominant mood during a beautiful prayer service attended by about a dozen parishioners,” she said. Masses had to be cancelled around Townsville diocese that day due to flooded roads. These included Masses at the city’s Sacred Heart Cathedral which experienced a power failure. Ingham parish priest Fr Damian McGrath said four Masses were cancelled in the area due to flooding rains in Cyclone Ita’s wake, but Church property had sustained minimal damage. “Ingham’s Sunday evening (April 13) Mass at St Patrick’s could not be held,” he said. “By then the town was split in two and it was unsafe to travel. Fr McGrath said “as far as was known” school property was undamaged although with schools closed for the holiday break this situation may change. He said the area was still rebuilding after Cyclone Yasi in 2011 with repairs worth millions of dollars to school and church buildings. Sr Masterson said it was “a miracle” Cyclone Ita, initially a category 5 cyclone, had lost much of its power before reaching Cooktown. She credited the power of prayer for this, speaking of “many wonderful stories of faith”. “For example, Lakeland Downs has about 50 Tongan workers who are wonderful prayers.